Mr. Egidijus Vareikis was born on 26th of March 1958 in Kaunus, Lithuania. He graduated from Vilnius University in Bioorganic Chemistry in 1981. In 1989 he received a PhD in Natural Science and Biochemistry. Mr. Vareikis was the head of the review unit of the journal Naujasis židinys from 1989-1991. He worked as an advisor on Defense and International Security at the State Reconstitution Commission of the Supreme Council and as an advisor to the Minister of Foreign Affairs. 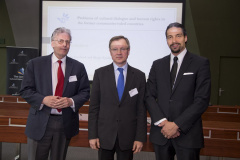 Since the fall of the Soviet Union, Mr. Vareikis has served as an active lecturer since 1996 on international and national security and policy challenges in post-communist countries at Vytautas Magnus Univeristy. From 1997 to 2000 he was the Head of the Department of Political Science of Vytautas Magnus University. 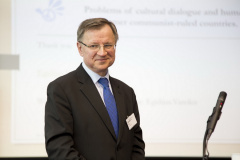 In 1998 Egidijus Vareikis became Envoy Extraordinary and Minister Plenipotentiary of the Republic of Lithuania. 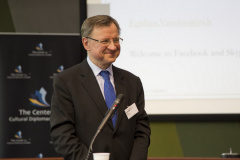 During his political career, Egidijus Vareikis was a member of several committees, including: Committee on European Affairs, Committee on Foreign Affairs, and Committee on Human Rights. He is a member of the political group Homeland Union - Lithuanian Christian Democrat Political Group in the Seimas from 2000 to 2012. He has been awarded several awards for his service and extensive knowledge such as the NATO Commemorative Medal and the Cross of Officer of the Order for Merits to Lithuania. He has published various books such as “Europe Becoming a Dinosaur: Emotional and Political Contemplations” (Dinozaurėjanti Europa: emociniai politiniai pasvarstyma) and “International and National Security” (Tarptautinis ir nacionalinis saugumas).